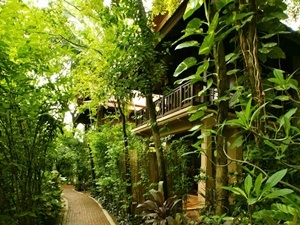 Rabbit Resort is a charming boutique resort offering 49 Thai-style cottages. The resort is located on the quiet Dongtan Beach, overlooking the ocean, and just a short distance away from Jomtien Beach. Golfers enjoy the tranquility or a private resort while still being close to all of the main area attractions. Rabbit Resort’s Grill House Restaurant sits on the sand overlooking the beach is the perfect place to catch the afternoon breeze or discuss those near misses from the day’s golf. A stay at the Rabbit Resort is guaranteed to be the centerpiece of a memorable Pattaya golf holiday.